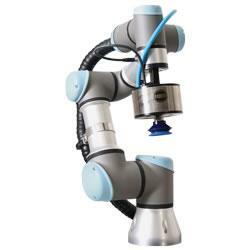 12/12/18, 12:09 PM | Industrial Robotics, Mobile & Service Robots | IDS Imaging Development Systems Inc. The Ensenso XR stereo camera from IDS can calculate 3D point clouds itself. Afterwards, it transmits the data via Gigabit Ethernet or WiFi to a host PC for further analysis. The advantages of the new camera series include, for example, significantly faster 3D data generation and reduced load on bandwidth and connected PCs. Models of the Ensenso N and X series make use of an industrial computer to calculate 3D point clouds. Since Ensenso XR cameras can handle the calculations themselves and transmit only the results, 3D data can be generated twice as fast, depending on the parameterization. Another advantage of the new camera series is that if data is transmitted via WiFi, only one cable (for power supply) needs to be connected to the camera. This is an advantage, for example, if the camera is installed on a robot arm. "Ensenso XR inherits the modular concept and precise detail capture of the X series and provides new scope through the fast capture of 3D point clouds, from which many applications will benefit," explains Dr. Martin Hennemann, Product Manager Ensenso at IDS. The camera series was officially presented for the first time at VISION 2018 based on a prototype. The model presented at the trade show is similar in terms of field of view and resolution to the Ensenso X series with 1.3 MP sensors and can precisely detect both entire pallets and small objects. For the detection of a packed Euro pallet measuring 120 cm × 80 cm × 100 cm, the Z accuracy was just under 1 mm at a camera distance of approximately two metres. For the start of the Ensenso XR series in spring 2019, two variants with uEye CP and uEye FA industrial cameras (protection code IP65/67) with 1.6 MP and 5 MP sensors are planned.